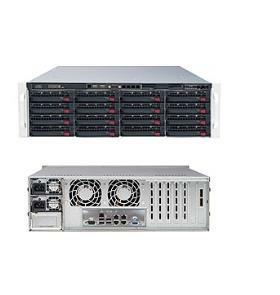 Supermicro 3U SuperStorage Server 6037R-E1R16N is designed for Compute Intensive Storage Environments such as Data Deduplication, Replication, Virtual Tape, NAS, IP-SAN, etc. Supermicro X9DRi-LN4F+, Enhanced eATX 13.68" x 13" (34.7cm x 33cm). Support two SATA3 6.0Gbps ports and eight SATA2 3.0Gbps ports (4x via SCU SATA). Support SATA RAID 0, 1, 5 (Windows only), & 10. Two SAS connectors, support up to eight SAS2 6.0Gbps internal ports. Support SAS RAID 0, 1, 5, 6, 10, 50, & 60. Support up to 240 HDD via SAS Expanders. Serial ATA: 2x SATA3 6.0Gbps ports, 8x SATA2 3.0Gbps ports (4x via SCU SATA). Serial Port: 1x Fast UART 16550 serial port, 1x internal serial header. LEDs: Power, Hard drive, Networking, System Overheat, & Power fail LED. Supermicro BPN-SAS2-836EL1 3U SAS2/SATA3 backplane with single LSI SAS2X28 expander chip. Three 80mm 9500RPM cooling fans with PWM control in the middle.